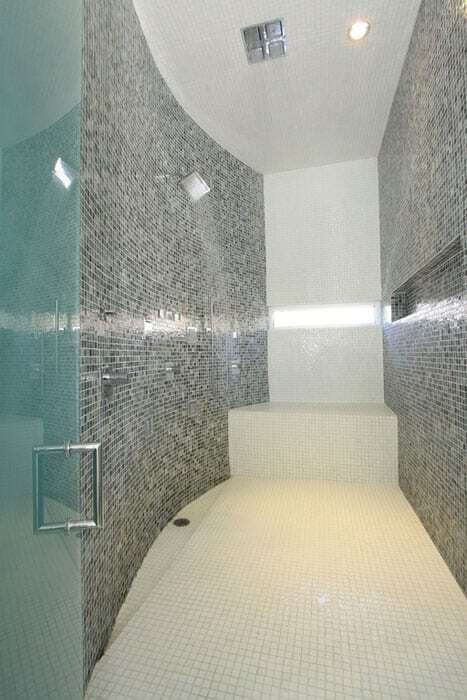 Here is our gallery of luxury walk in showers with beautiful design ideas. There are few things more luxurious than relaxing in a gorgeous high-end shower. 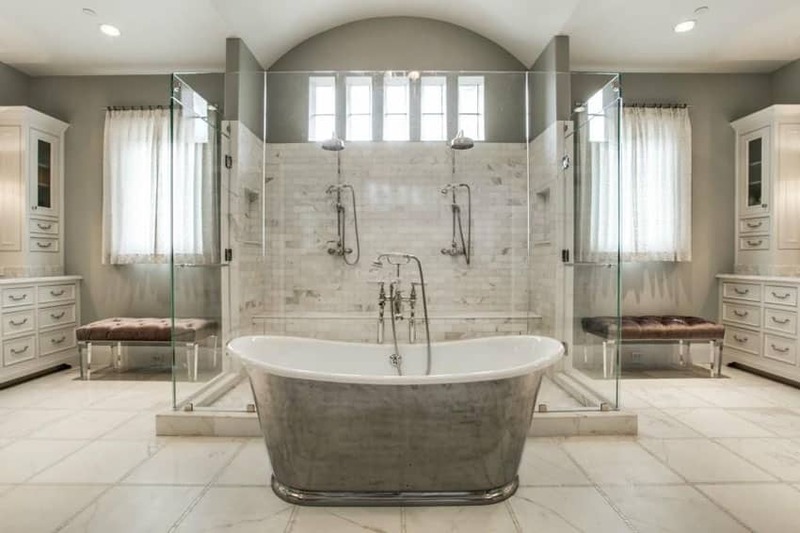 Picture yourself in one of these luxurious high-end showers and find the one that fits your idea of the perfect dream bathroom. This shower area exudes both simplicity and luxurious elegance. The space is enough for three people to use as once, and is separated from the bathroom with frame-less glass partitions and doors. Large slabs of marble were used all-over the floors and walls, even the built-in bench. There are 2 wall shower spouts, and one rain-shower spout from the ceiling, for a more luxurious feel. A beautiful walk in shower should provide a serene feeling of luxury and escape. 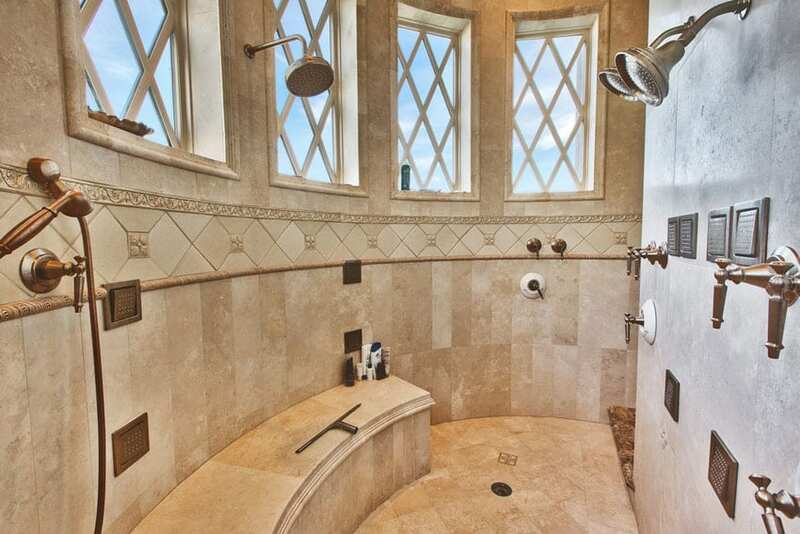 Some of the most sought after shower designs include glass walls for unobstructed views, natural stone surrounds, seating bench and rainfall shower heads. Color and texture of the shower plays an important part in its ambiance. A neutral light color palette can keep things feeling bright. Glass surrounds can offer an open feeling and eliminate the barriers between spaces in the bathroom. 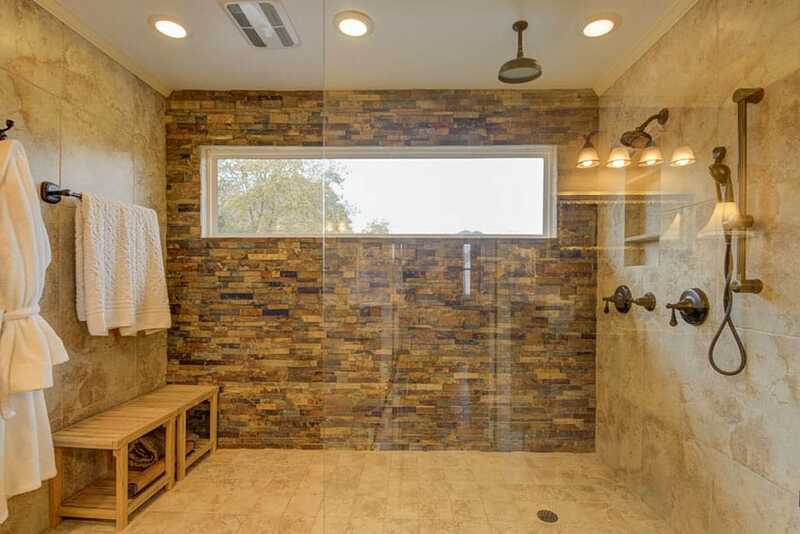 Those who want a more natural feel in the shower can opt for stone surrounds with a lot of natural light to give the feeling of showering in an outdoor environment. Imagine yourself coming home from a long tiring day at work and walking straight to a relaxing warm bath under a blissful rain shower in a tranquil master’s bathroom. What could be more better than having your very own serene spa at home? People nowadays put a lot of premium to well planned bathrooms because of the amount of time spent in them within a day. As bathrooms are considered to be one of the most used areas in the house, its design must not only be aesthetically pleasing but functional as well. With more homeowners being geared towards a modern approach on bathroom design, walk in showers have become a trend. These areas have now become an “all in one” place of rest and relaxation. Gone are the days where a bathroom just features a plain water closet and a small shower area. Walk in showers are now fully furnished with spa tubs, heated showers, vanity sets and seating area. For homeowner who like to indulge in its luxury, a walk in closet is also included inside the bathroom. What is a Walk in Shower? A walk in shower is considered to be a modern innovation in the bathroom design scene. Typically, walk in showers are not enclosed – you simply walk into the shower area without having the need to step over or open doors. However, a walk in shower is more of an umbrella term, because it can be applied in so many ways. Firstly, and the most obvious reason for its name is that a walk in shower is any shower area that isn’t obstructed by a door and can be accessed by simply by walking in. It is closer to the ground level of the bathroom, with minimal change in floor height. It can be enclosed by some sort of partition such as a single glass panel that serves as the divider from the other areas of the bathroom. In some less popular designs, a walk in shower is a separate room or cubicle with three walls using tiles, natural stone or glass blocks. However, in some designs, a walk in shower can include a glass door. Glass is a highly preferred shower door material because it doesn’t make the space feel cramped and is also easy to clean. Below we explore some luxurious walk in shower designs together with their negative and positive features. To help you weigh your options and to assist you to decide what design is the best for you, here are some of the advantages and disadvantages of having a walk in shower. Contributes to the overall impact of your home – Walk in showers are elegant additions to homes, making them look more luxurious and elegant. It contributes aesthetic appeal, renders a fresh vibe and lends a contemporary flair not only to bathrooms but to the whole interior of the house as well. Emphasizes the feeling of space – With its open design and uncluttered look, walk in showers give bathrooms a sense of space making them appear more airy and breathable. 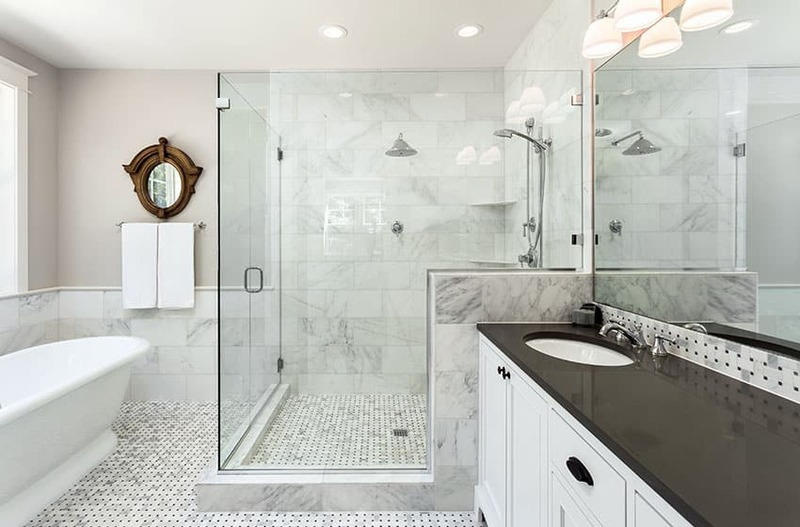 A walk in shower also typically uses a lot of semi opaque materials like glass and glazing which make bathrooms look bigger by allowing the eyes to see every inch of existing space. Creates a stunning focal point – A well designed walk in shower can serve as a main feature for a bathroom space, especially if finished with striking materials such as glass mosaic tiles or natural stone. Suits modern or contemporary design – The design of walk in showers are devised to obtain a smooth transition and continuous look. Its streamlined look perfectly matches modern and contemporary inspired homes, but it can fit into traditional design as well. Also, walk in showers usually make use of a transparent feature such as a seamless or frameless door which creates a continuous design that doesn’t compete for attention with other decor. Custom design – All walk in showers are modified to meet one’s specific needs. This is custom fit depending on the shape and size of your existing bathroom space. Walk in showers are also known for their versatility. When it comes to aesthetics, a walk in shower offers endless possibilities in design as it can be finished with different materials and furnished with different accessories. It can be designed to accommodate any type of fixtures or features and offers several options for layout or configuration depending on your bathroom space. If the size of the existing area permits, homeowners can build a walk in shower with a separate tub, some storage and seating. Easier to Maintain – Most walk in showers have flat surfaces leaving no area for the dirt and grime to seep in. Also, it is easier to clean because all you have to do is step inside and everything is readily accessible. Depending on the type of your flooring material, maintenance becomes a quick and easy fix. More accessible– A walk in shower provides maximum accessibility and allows the user to move more freely because of its spaciousness. Conforms to ‘Universal Design’ principles – Since walk in showers are spacious and usually omits the need for a door, it has enough clearance to accommodate all sorts of users, especially the elderly ones or those who have limited mobility. 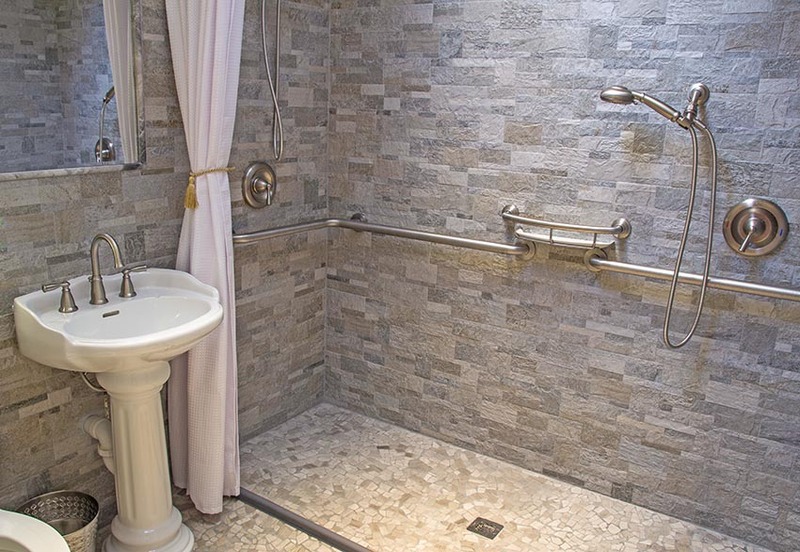 For wheel chair bound users, getting in and out of a standard shower area may be a bit hard, especially if the space is too tight. Also, one major selling point for walk in showers is that they have a safe bathroom setup with minimal floor level change, eliminating the high risk of a trip hazard. There is less challenge involved. As mentioned earlier, walk in showers provide maximum accessibility, which in return makes them “mobility friendly”. Will last for years – Walk in showers are known to last for years as they are highly durable and can withstand the everyday wear and tear of constant use. If installed properly and built with the right materials, it can serve as a cost effective long term investment which will give you a lot of benefits in the long run. When it comes to design, walk in showers are also known for their timeless looks which do not come out of style. Gives you a place to relax and unwind – Walk in showers offer a haven of personal rest, relaxation and retreat. It’s large space and open layout makes you feel like you’re stepping into a spa every time you use your bathroom. Convenient and provides ease of use – A lot of people favor using the shower than taking a bath in the tub simple because it is quicker and more convenient. This is also more useful during mornings, when you do not have the luxury of time before going to work. Its design is very straightforward too – it’s as simple as walking directly into the shower and enjoying your bath. 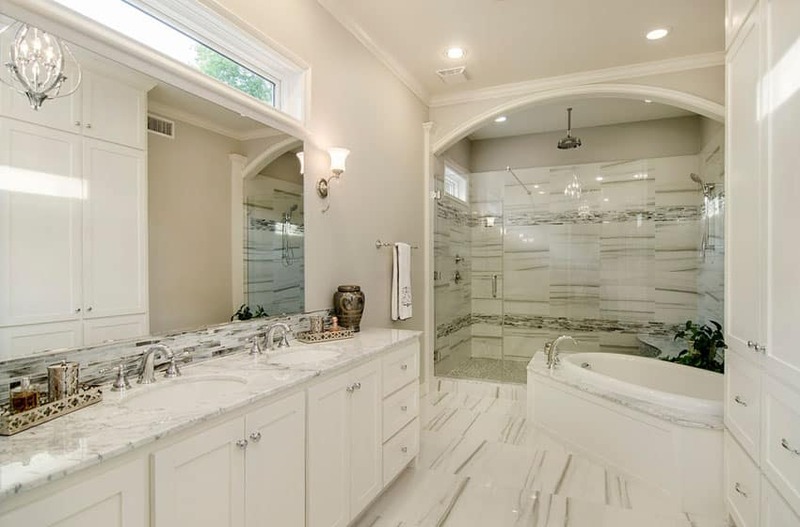 If your walk in shower has more features like a bathtub, vanity or a sink, all of the activities you need to do to get ready are centralized in one area, thus minimizing the need to walk from one place to another. Increases the value of your home – Any home looks extra appealing when it comes with a luxurious walk in shower. It increases the value of your home, making it more attractive for potential buyers in the event of a resale. A classic-inspired bathroom which combines the space of the walk-in closet and the bath, and also demonstrates excellent sense of balance. Floors are simple marble tiles, with tiny mosaic tiles in between each tile, acting as “grouting”. Smacked in the middle of the space is the metal free-standing tub with a unique texture. and the semi-enclosed shower are which uses marble subway tiles for both its floors and walls. A beautiful cast iron bathtub makes an impressive centerpiece and is a great place to soak and relax. Air circulation – Due to the openness of walk in showers, they tend to get cold. They do not hold in heat well and may sometimes require an additional installation of heated flooring. More expensive than other shower designs – Walk in showers generally cost more than regular showers because of the materials it uses and its advanced features. Usually, walk in showers require a well planned drainage system and special finishes. Since building a walk in shower is also considered to be a major project, it requires professional installation thus generating additional labor costs. Prefabricated walk in shower units are quite affordable and may be considered as a good alternative. It is advised that before you commit yourself to installing one, make sure that you evaluate your budget first. Slip Hazard – Typically, walk in showers have a uniform floor level all throughout, however for traditional designs and for practical reasons,some walk in shower designs feature a raised platform or a zocalo that needs to be stepped over to in order to enter the shower area. If not careful while entering the walk in shower, mone might encounter the risk of tripping over or slipping. Make sure to take this hazard into consideration as you plan your walk in shower design. Water build up – Since walk in showers usually follow a minimal change in floor level, there is a tendency for water puddles to build up in your bathroom. This is more prevalent for most walk in showers that follow a ground floor level all throughout the bathroom. Even if your walk in shower is designed well, there will still be a possibility of water escaping. However, this problem can be prevented by constructing the flooring of your walk in shower at a sloped angle or by using a zocalo or a splash guard. Water resistant materials like natural stone, metal or glass can also be incorporated in your finishes to address this issue. Takes up a lot of room – Given that walk in showers are spacious and that it follows an open layout, they require more space and take up a lot of room in your home. It is not really meant to be placed in a small area because it will make it look even tighter and more cramped. Does not provide much privacy – Walk in showers are usually designed with a sense of openness and more often than not, they have not, they have no doors or feature a lot of glazing. Glass doors and glass partitions do not provide much seclusion. If you find your walk in shower lacking in privacy, you can always rectify this by using frosted glass or tinted glass instead of a plain clear glass panel or shower door. It is a major project – Upgrading your bathroom into a luxurious walk in shower takes up a serious amount of work. Building one would entail the services of a professional, thus resulting to additional labor costs. It is not meant to be a “Do it Yourself” project and may need more time to install compared to regular bathrooms. The combination of white and cream colors makes a timelessly beautiful palette which could match any interior style. To give it a bit more dimension, a variety of textures and patterns were applied. The porcelain floor tiles have horizontal gray patterns similar to soapstone, half of the wall has horizontal wood cladding, while the shower area combines 2 types of mosaic tiles. Build with proper care – Typically, a six feet open space is recommended around walk in showers because any area that is within that 6 feet radius is considered as a splash zone. Drainage is also another integral part of walk in shower design. To obtain an effective drainage system, make sure that the floor is angled or slightly sloped so that the water drains well and doesn’t build up in certain areas of your walk in shower. To save on space, take advantage of corners – Although there is no limit as to how you design your walk in shower, putting it in the corner saves you more space. Another practical reason for this is that it is easier to contain water splashes into a single area. Consider safety – Safety should always be the number one priority in bathroom design. Many walk in showers use bacteria resistant materials and non slip shower flooring. Not only do these materials lessen the risk of an accident but these are very beneficial in the long run because they are easier to clean, more sanitary and is guaranteed to withstand constant exposure to moisture. Opt for moisture resistant materials – The bathroom is constantly exposed to moisture which makes it prone to water damage, molds and mildew. Using the appropriate finishing materials can help you prevent its occurrence and will give you a longer lasting walk in shower. Use moisture resistant materials such as natural stone, porcelain tiles, ceramic tiles, glass and metal to build your walk in shower. Use a shower tray – If going for a uniform level shower area, make sure to incorporate a shower tray in your design. The main purpose of the shower tray is to keep the water localized in a single area, preventing it to spread over other areas. The build up of water puddles in your bathroom are also minimized. Choose the right shower head – Aside from enhancing your bathing experience, using the proper type of shower head can also give you practical benefits. Large shower heads give you more water, simulating the effect of the falling rain. An overhead rainfall shower head directs the water straight down, thus minimizing splashing water out of the shower area and preventing your bathroom from soaking wet. Incorporate storage – To optimize the use of your walk in shower, incorporate a shower niche into your design. A niche is a small built in opening in the wall that can be used to store small items like toiletries or bath accessories. A wall niche also saves space because there is no need for additional furniture such as cabinets or shelves. Incorporate seating – Some walk in showers features a ledge or a built in bench which can be used for seating while showering. This is very useful for homeowners who take long baths and spend a good amount of time inside the walk in shower. Aside from the added comfort, a built in shower bench is also practical for elderly users or people with mobility problems who can’t stand long enough while showering. A built-in shower bench is typically made up of ceramic tiles which match the wall of flooring of the bathroom. Try some added features – If you have the extra budget, special features may be added to your walk in showers. These feature heightens the experience of using your walk in shower. Examples of which are showers with special settings, water jets, hydro massager and heated flooring. It may cost you some additional costs but these will give you more pleasure and enjoyment while bathing. Go for a cohesive bathroom design – Make sure that all of the elements of your walk in shower harmoniously blend with the other features of your bathroom. Consider a flowing design for your walk in shower that transitions smoothly in order to create a spacious feel for your bathroom. Make sure that all elements jive together to produce a cohesive overall look that isn’t too overwhelming. This is also highly fitting for modern and contemporary inspired bathrooms. Even if you want to make your walk in shower as the main feature for your bathroom, it still has to be coherent to the other design features in some way. Plan for long term use – It is best to prepare ahead if you plan on living in your house for a long period of time, especially if you see yourself using it as a retirement home. Design your walk in shower in such a way that it can accommodate your future needs as you age. Also, you might as well build it in a way where you can get maximum pleasure and enjoyment if you will be using it for a long time. This elegant master bathroom features detailed tile work with marble surfaces and a large soaking tub with glass enclosed walk in shower. The low profile chandelier is a nice touch that reinforces the luxurious ambiance. 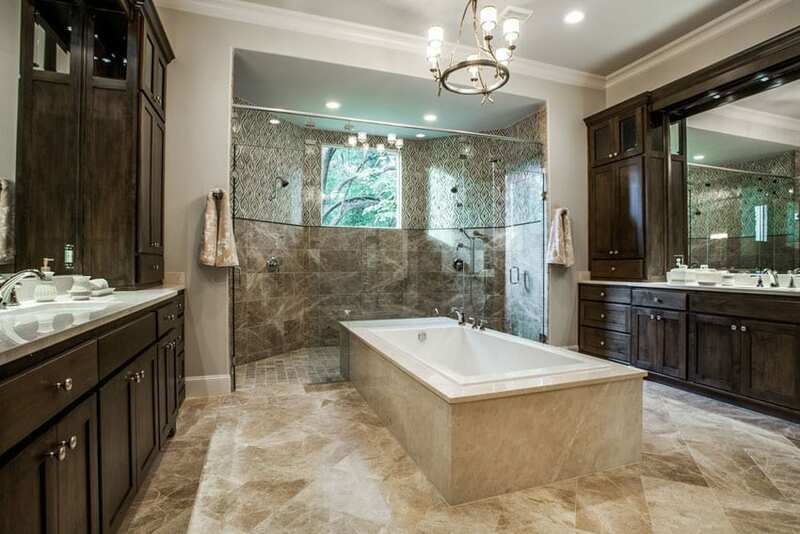 Using warm, neutral colors, this luxurious bathroom exudes elegance. The floors are brown marble, laid out in a running bond pattern, while the shower area’s floors uses the same material, but in smaller sized tiles. 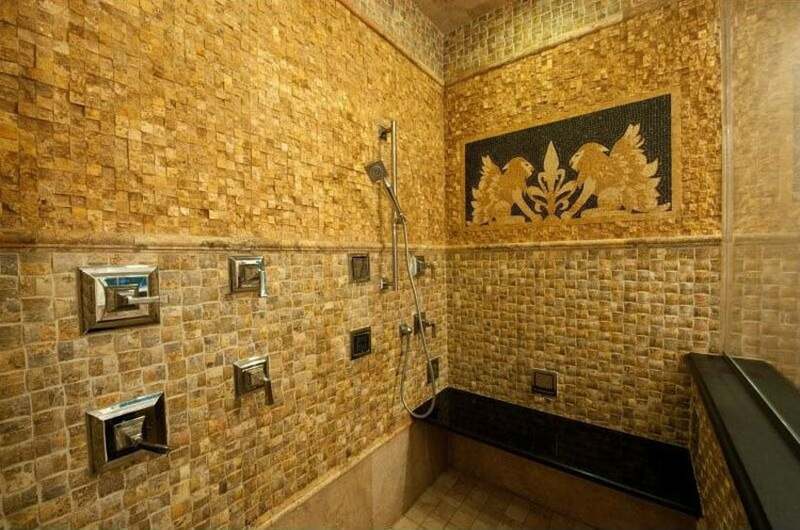 The walls of the shower are are brown marble tiles as well, but mosaic tiles instead of individual tiles. The shower area is surrounded by full-height frame-less glass for a more modern look. The bath tub area and the vanity matches each other, with both using dark walnut wood combined with white marble. This gorgeous bathroom features traditional Georgian style influence. It uses a combination of golds and sage green for light & refreshing look. Walls were clad in metallic gold wallpaper, floors uses yellow granite tiles, while the floors and walls of the shower area is completely clad in green travertine, matching the textiles used on the furniture and the curtains. A modern minimalist bathroom design which combines natural stone finishes with modern ceramic tiles with unique finishes. Floors and one wall were clad in brown-colored tiles with a distressed look, giving it an industrial appeal. The longer wall, on the other hand, uses porcelain tiles with horizontal patterns in gray, mimicking the gradient effect of natural stones. The bathtub is a drop-in type, surrounded with a cladding of green soapstone, while the shower are is covered with full-height frame-less glass partitions. Going for a more clean & bright look, this simple yet elegant minimalist bathroom has the right combination of whites and wood finishes. Floors uses white porcelain tiles with light gray grains mimicking natural stones. Walls are plain white, while the counters uses wood laminates in light walnut wood finish to add a subtle warmth to the space. The 2 shower areas and bath tub area definitely enjoys the marvelous view of the infinity pool and the ocean as they were all placed beside the full-height windows. 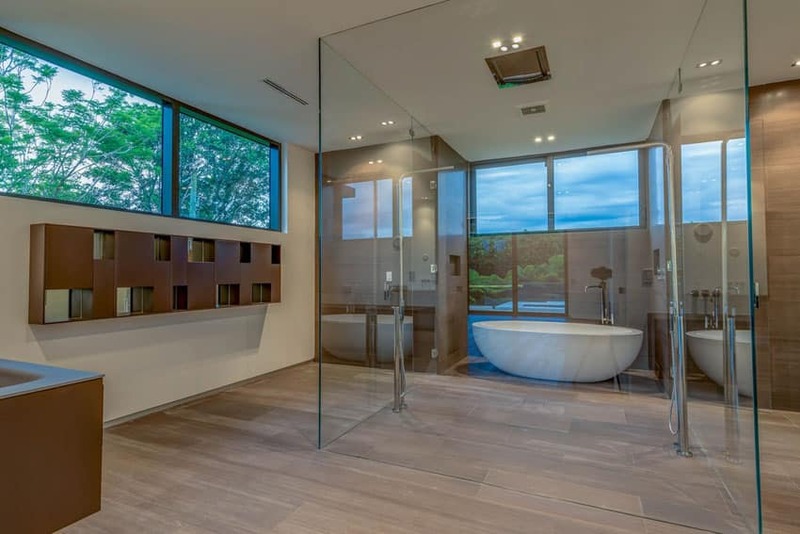 The two shower areas uses clear frame-less glass partitions with maple wood decking for its floors, while the bathtub is a modern freestanding tub. Using only one type of stone finish throughout the bathroom could be boring, but this design makes it a bit more dynamic, by creating patterns using the natural grains of the stone. White granite was used for both the floors and walls – the floors uses standard 30×30 tiles, while the walls uses larger slabs and creates a diamond pattern, similar to the technique used on wood veneers. This creates an interesting dynamic feel to the surface, and at the same time, exudes simplicity and elegance. The vanity counter is simply made from laminated marine plywood, the shower area for two separated with frame-less glass partitions, while the bathtub was placed beside the window for a view of the city. This classic-inspired bathroom design has the motifs of sinuous curves of its classic influence, but also exudes modern simplicity through the choice of finishes. The whole bathroom keeps to its white and cream color scheme of a clean & bright look. 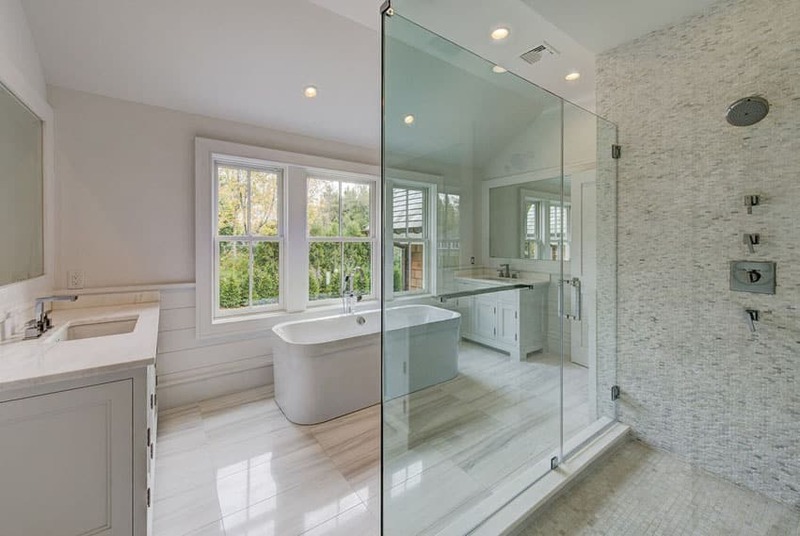 Walls were painted in a very light cream color, and the two corner shower areas uses full-height frame-less glass partitions while its interiors were clad in white marble with gray/cream grains. The bathtub makes you feel like a royalty, as it was placed right in the middle of the bathroom, making it the focal point of the space. His and her glass enclosure showers offers symmetry and beauty to the interior design. 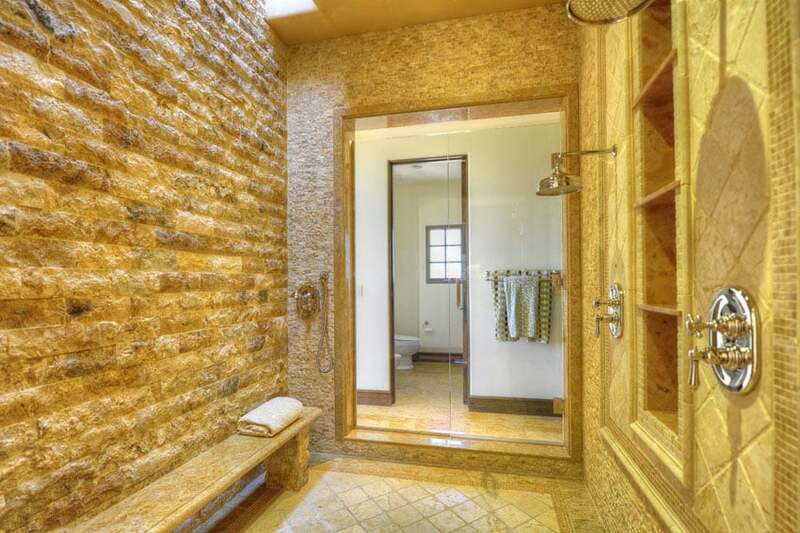 This Mediterranean style bathroom goes for a more rustic look with its combination of wood and stone finishes. Both the walls and floors were mostly covered with rustic wood finish ceramic tiles, while the shower area adds a bit more texture by using river stones on poured concrete for its floors and a strip of the wall. The rest of the bathroom keeps it simple – light beige walls, wengue-finish for the base of the vanity and white quartz for its counters. This modern bathroom design goes all-out with its obvious love for marble. All walls and floors were clad in marble tiles, in varying sizes to help delineate each area from one another. The main bathroom area uses basic 30×30 tiles in a diagonal layout, with the shower area’s floors uses smaller mosaic tiles. The walls were clad with slabs of marble, showcasing its natural beauty. This is a great idea for those who wants to achieve that elegant bath look, but has limited space. This design combines the 2 shower areas and the bathtub area, and is only separated with a very low zocalo. Walls were clad with vertically laid-out wood finish ceramic tiles, while the floors uses randomly-shaped small broken pieces of cream-colored granite. The combination of classic design style and modern color palette definitely suits this elegant bathroom design and adds to its appeal. Going for a really simple white and gray color palette, it helps bring out the details of each finish and furniture pieces. Floors uses hexagonal marble mosaic tiles, while the walls were simply painted in white, with panel design on the vanity area. Of course, it has matching white paneled base cabinet with gray soapstone counters. The shower area on the other hand, uses gray soapstone tiles for its walls and floors, creating a contrast against the primarily white bathroom. The addition of a chair and a square ottoman adds to the elegant appeal of the bathroom as well. A beautiful bathroom design which uses an excellent layout to achieve this simple yet elegant design. It uses light teak wood finish ceramic tiles to give it that rustic feel, while the plain white walls and ceiling gives it that clean modern vibe. True to its modern aesthetic, the vanity is a cantilevered counter clad in white solid surface, with under-mount ceramic sinks and frameless mirrors. The shower area has clear glass partitions and doors, and uses gray sandstone finish porcelain tiles for its walls and floors. Sticking to simpler palette works really well especially on smaller spaces. This bathroom uses only a combination of creams/beige for both walls and floors, creating a simple yet visually appealing bathroom design. There’s a shower area with frame-less glass partitions and an elliptical freestanding tub placed right beside the windows for a relaxing view of the garden. Despite the limited space, this modern bathroom design manages to create a very unique bathroom design. Upon entry of the bathroom is an x-framed bench placed against a wall with glittered wallpaper and a small window. Going to the left, you will see the clear glass door & partition leading towards the bath area. This area definitely stands out as it uses black ceramic tiles for its floors, and black soapstone on the walls, coupled with black-painted ceiling. Inside, there’s a wall-type shower, and a rainshower which was recessed on the ceiling for a natural shower feel. 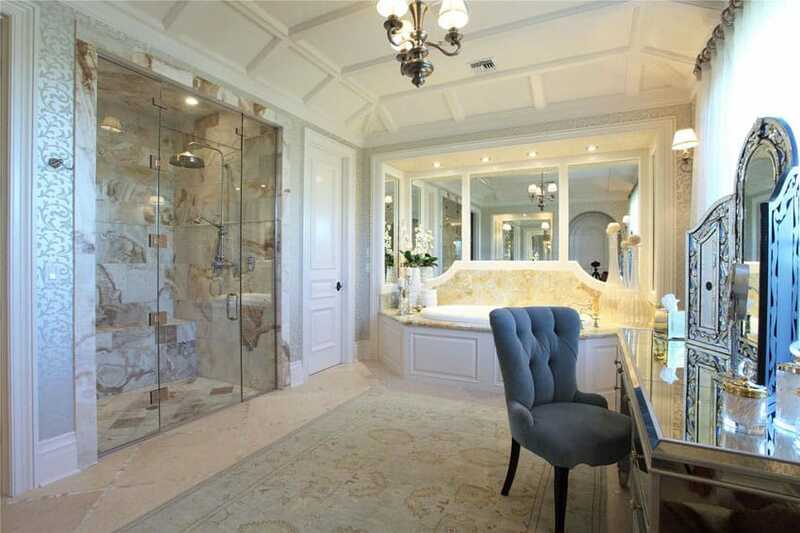 You will definitely feel like a royalty while bathing in this very luxurious bathroom. Walls are covered with metallic wallpaper with flourish patterns, while the ceiling has a unique paneling design. To compensate for the lack of view, the bathtub area uses mirrors with white frames to create an illusion of windows. 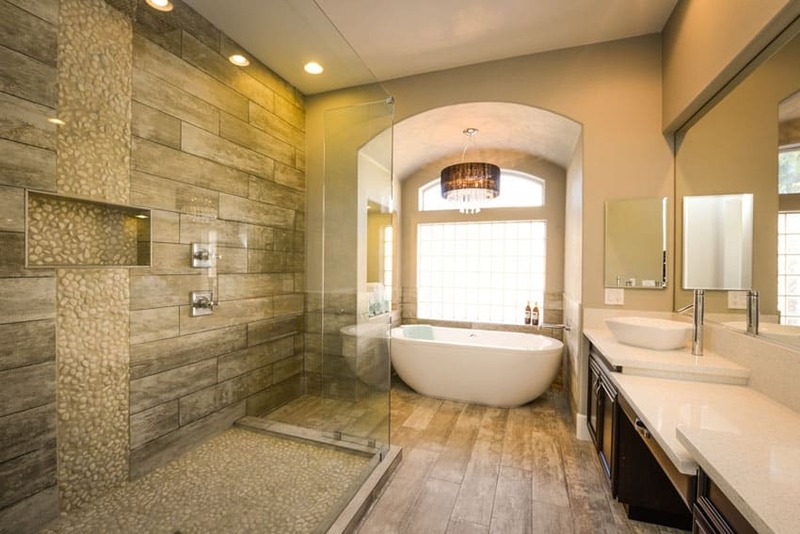 The shower area, on the other hand, uses brown travertine on both its floors and walls, and is separated from the rest of the bathroom with clear glass partitions. In the middle is a large mint green tapestry area rug, and a mirrored vanity table with a 3 paneled vanity mirror, and a matching tufted chair. What’s unique about this bathroom design is that its main floors are not tiles or stones, but solid pine flooring. This makes a more cozy and laid-back feel to it, making it look warmer and less “cold”, typical of bathrooms. Because the main floors are wood, a low zocalo step helps separate the shower area from the main floors, along with frame-less glass partitions. The shower area’s walls are clad with dark gray stone, while the floors are made up of small square cream-colored marble tiles. A transitional style bathroom with the same refined elegance of classic design, and the simplicity of modern spaces. It combines white and gray for a minimalist color scheme, which works for all design styles. The well-polished floors are made up of thin tiles marble, laid out in a chevron pattern. 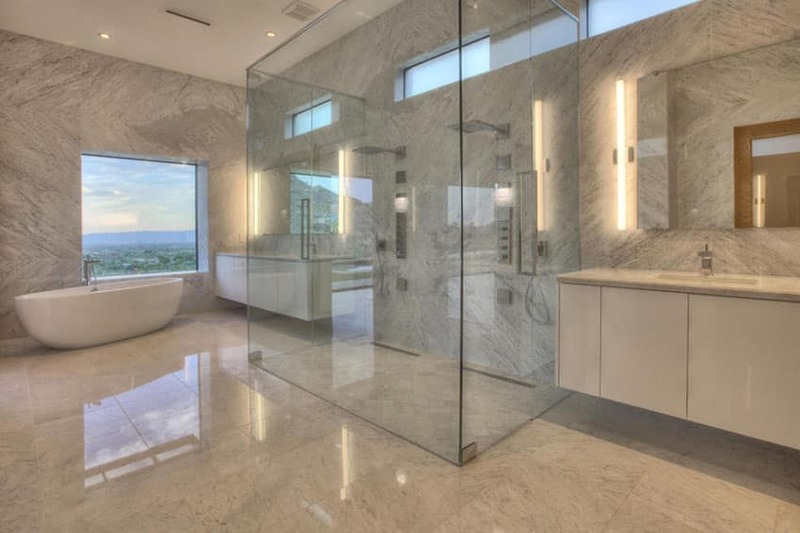 The walls are painted in gray, with white panels and moldings, while the shower area is clad with slabs of marble, creating a diamond patter with its grains. A gorgeous modern bathroom wit lots of space and a unique concept of bringing the outdoors inside, through the use of real plants. Floors are textured porcelain tiles, which goes up a platform wherein the bathtub is placed right beside a large picture window. Planted along this window are rubber plants to help make it look like its part of the outdoor view. The step-in shower features a window view, rainfall head with separate detachable spray head and an interior sitting bench. A small bathroom which definitely shows obvious favor for marble tiles, as it was applied throughout the walls of the whole bathroom, even including the cornice. To help balance it out, the floors are coffee-colored satin finish tiles and the ceiling was painted in a light mocha color. 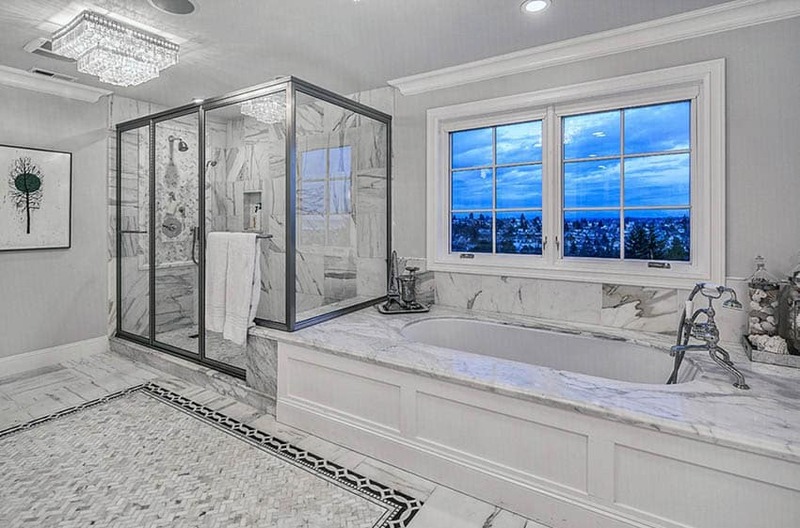 Gorgeous view of the skyline is very visible through this bathroom’s large picture windows. The compensate with the busy skyline background, The bathroom’s interiors keeps to a simple all-white color scheme with a few yellow accents. Floors uses white porcelain tiles, while the walls are covered in white marble with very light grain patterns. 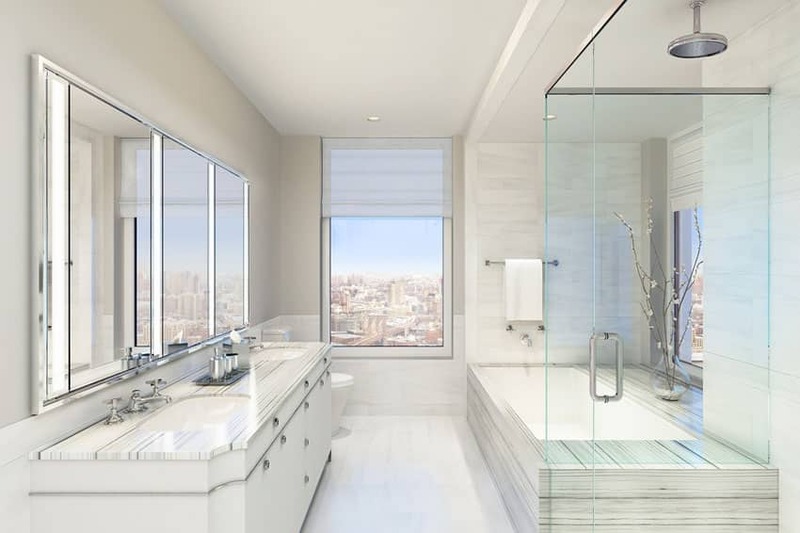 The shower area is separated from the rest of the bathroom through clear glass partitions, allowing you an unobstructed view of the city from anywhere in the bathroom. Neo-classic motifs and design elements makes this bathroom feel like you’re a royalty. 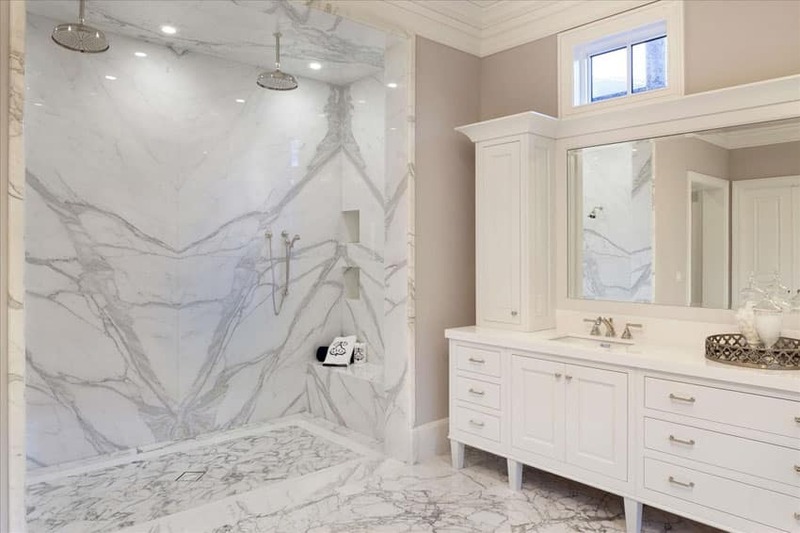 Adapting a simple all-white color scheme, this design definitely exploits the beauty of natural marble as it was used on all of the floors, and even including the faux columns and the while inside of the shower area. Large showers are extra luxurious because they have adequate room for more features. Having the luxury of space, it can accommodate not only a walk in shower but also a bathtub, a large bathroom counter with sink, some storage systems and furniture pieces like a bench, dresser or vanity. In some cases, a spa tub is included for added relaxation. In addition to that, large showers can accommodate more than one user. Some large showers also come with his and her sinks which allow couples to go about their daily hygiene routine simultaneously. Large showers can also be configured in a such a way that they are connected to a walk in closet. This is beneficial because it localizes all activities associated with “getting yourself ready” into one centralized location, saving you time and effort. Having the luxury of space, this bathroom creates a spacious shower area and a large vanity counter. The left side has the vanity counter with 2 sinks and a powder area in between, while the right side has the shower area with enough space of two people to use at the same time. In the bay window area is of course the freestanding bathtub in which an electric fireplace and a tv was installed on the wall right by it, allowing you a luxurious and warm soak when you need to relax. Natural colors and minimalist forms in this gorgeous bathroom design shows modern and Asian influences. Floors are covered with walnut finish ceramic tiles, while 2 of the walls were clad with wood laminates. The rest of the walls were simply painted in an off-white color, making the wall-hung shelves laminated in chocolate brown stand-out. Right in the middle of the bathroom is a large partitioned area, inside of which is the free-standing bathtub and the frameless glass enclosed shower area. Gong for a Mediterranean look, this bathroom design combines warm colors and textured finishes to achieve the look. Walls of the large shower area uses natural sandstone bricks on its walls and smaller golden slate on the other walls, combined with natural polished stone floors. 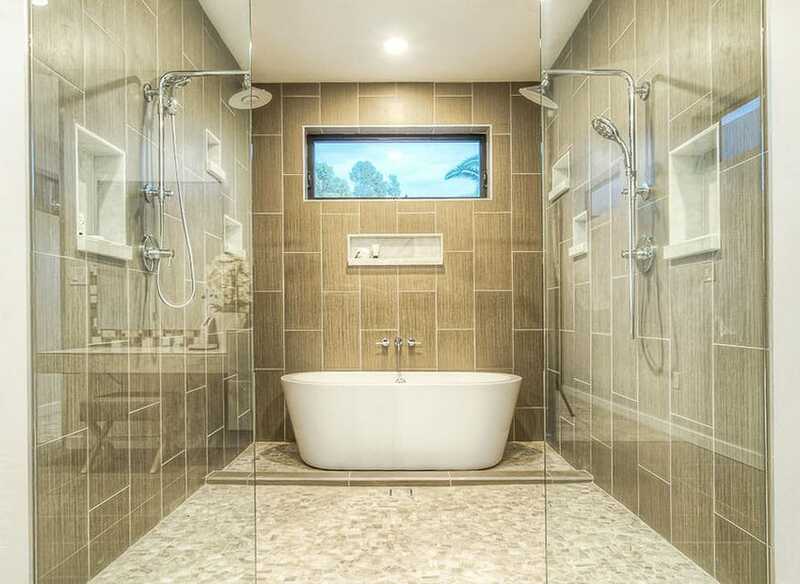 The rough texture of the wall finishes and the skylight in the shower area gives it that natural outdoor feel. Using soft rose pink on the walls gives this bathroom a dainty look which definitely looks perfect with the white cabinetry and the white marble tiles used on the floors and the walls of the shower area. The result is a feminine and elegant bathroom design. A small space shouldn’t hinder you to design a very luxurious bathroom. This is a great example for that. This small shower area was placed in the rounded/curved part of the wall with 4 windows, making it look bright despite the small space. The walls and even the floors were clad with cream colored slate tiles, and has ceramic accent tiles in the middle of the walls. To match the warm tones of the tiles, brass-colored fixtures were used. To make your bathing experience even more exciting, aside from the usual shower heads and telephone showers, there are also body sprays installed on the walls. Because this bathroom has a bit of a limited space, it gets a bit creative with its layout. The drop-i bathtub was placed on the corner perpendicular to the shower area wall to help make it fit, while still maintaining the amount of storage you can keep. Aside from its uniquely-shaped layout, what’s special about this bathroom design is its PWD provision, as it places handrails leading to the enclosed shower area. It’s an important design factor people tend to overlook, especially on public spaces. The shower area itself is pretty simple yet looks very posh and elegant. It’s spacious, with lots of natural light coming from the bay windows, and uses cream colored tiles on both the floors and walls. A modern bathroom design which is really busy with the amount of textures and patterns you will see, despite its limited size. The floors itself is already quite busy, as it uses mosaic tiles in various tones of brown, with natural stone patterns. The walls on the other hand uses cream and brown soapstone, cut in the middle by two rows of the same mosaic tiles used on the floors. The result is a simple color scheme which is perfect for small spaces. A spacious modern bathroom situated right beside the backyard garden, giving the space natural light and a pleasing natural view. Floors of this bathroom is walnut finish ceramic tiles, and marble tiles all over the walls. The vanity uses dark walnut for its cabinets and white solid surface for the counter. The interesting part of the design would be the large shower area in the middle of the room. It’s a bit spacious and is directly in front of the window so you can have a nice view while taking a shower. It’s frame-less glass partition also helps separate it from the rest of the bathroom, without blocking the light and view from the window. What makes this bathroom unique is that fact that it doesn’t have a door, and is directly connected to the living area via an arch opening. When you enter, you will see the vanity area right away, which is topped with marble and uses wengue-finished base. Most of the walls are simply painted in an oatmeal color, but the walls where the vanity was placed against is clad in white and brown mosaic tiles. The shower and tub area is separated from the vanity via an arch opening as well. Natural stone is one of the most popular materials for walk in showers because of their distinct beauty and positive inherent qualities. This material is well loved by homeowners and designers because they bring a sense of natural coziness to a space. 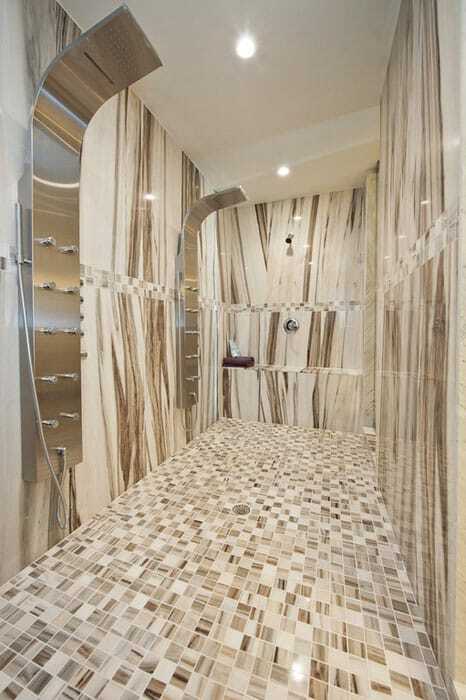 Aside from that, stone walk in showers give warmth and make bathrooms more inviting and relaxing. This is also highly suitable if you want to achieve a “spa like” ambiance for your bathroom. 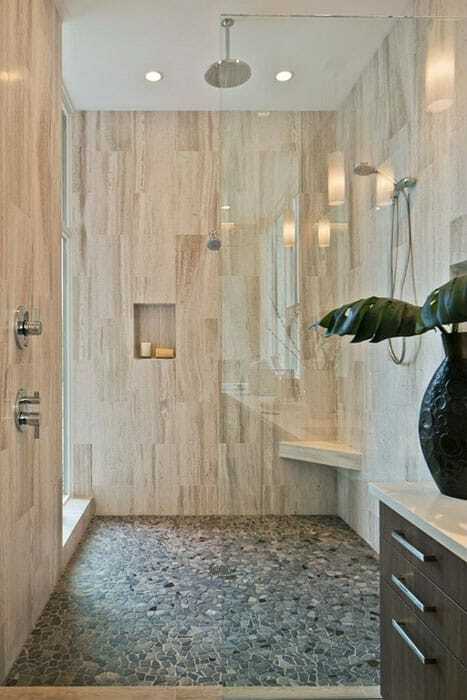 Common types of natural stone for walk in showers include travertine, slate, pebble and marble. Travertine tiles are characterized by its warm beige to honey like tones and rough pitted texture. This is commonly used for bathrooms which have a Mediterranean inspiration or an “old world” feel. The coarse texture of travertine makes it highly slip resistant, however its porosity is one of its major drawbacks. In order to prevent water from seeping through travertine showers, sealant must be applied to the material. When mixed with other materials, travertine looks extra luxurious and elegant. Slate, on the other hand, is characterized by its sleek look and subdued color. With hues ranging from dark grays to subtle undertones of cool grays, this type of natural stone usually come in a matte finish. It is known for its durability and water resistant qualities which make them fit for areas which are constantly exposed to moisture. Common applications for slate is for contemporary inspired walk in showers. Pebble is the top choice for showers and bathrooms which have a spa like look. Usually placed along the floor, this material gives a soothing feel for the feet while showering. Aside from its rustic appearance, pebble is naturally slip resistant , reducing the risk of hazards in the shower area. Pebbles look extra beautiful when paired with contrasting sleek materials such as glass and smooth surfaces. Marble is the epitome of classic sophistication and timeless beauty when it comes to natural stone materials. Marble comes in a wide variety of colors, with white being the most popular of all. Its distinct veining pattern and exotic swirls help bring a touch of drama to walk in showers and bathrooms. This type of natural stone looks extra stunning when used to achieve a uniform look. Using the same type of marble for the floor, walls and countertop produces a harmonious design with smooth transitions. Since walk in showers are constantly exposed to water, it is best to take necessary treatments to ensure proper protection for your stone. To maintain the look of natural stone for your walk in shower, periodic sealing is required. Unsealed stone may cause water to seep in its surface, thus causing breakage. Make sure to coat your stone with the proper sealer to guarantee a lasting quality. Gothic architectural details definitely makes this bathroom design one-of-a-kind, and somehow takes you into a time machine. Most bathrooms combines a variety of finishes on its walls, but this design is 90% composed of the same brown granite tiles. Only the shower area’s flooring and wall tiles is a bit different from the rest. This shower area might be small, but it was able to maximize the limited space it has, and is still able to exude a luxurious ambiance to it. Due to the small space, the bathroom just keeps a gold/yellow color scheme so that it won’t look too busy. This meant that the walls, the built-in bench and the stone moldings are all made from gold granite. He floors, however, adds a bit more texture as it uses mosaic hexagonal tiles which is a bit lighter and more neutral in color. 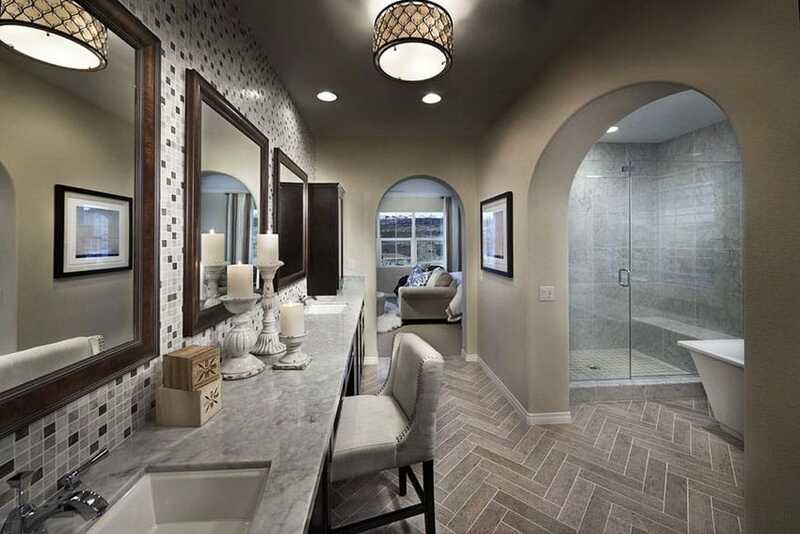 This bathroom directly connects to the bedroom via an arched opening, making it directly accessible and visible from the bedroom. The shower are is a simple semi-enclosed area, with door-height glass partitions and stone tiles all over its walls. Despite using the same tiles all-over the shower area, the variety of patterns in which the tiles were laid-out still makes it look like it has a variety of finishes going on. This small bathroom might be on the small size,but it’s design still manages to look elegant. The shower area has a half-partition made of frame-less glass. The walls were clad in light beige sandstone tiles, while the floors are made of small pieces of dark gray slate, adding texture to the surface. Using the same kind of light sage travertine tiles all over the bathroom, this modern space manages to create a simple yet appealing design. 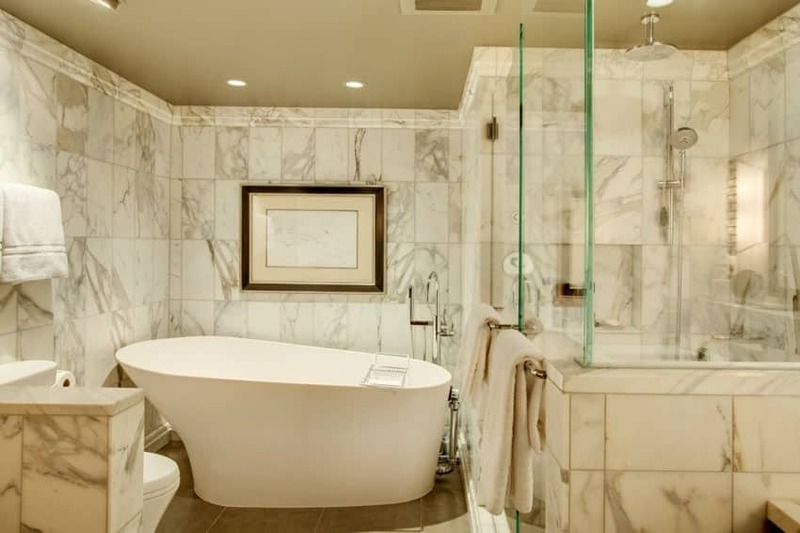 Right beside the oval bath tub area, is the long shower area good for 2 or more people. It is divided from the rest of the bathroom through a a glass partition with stainless steel framing. This small bathroom is very simple, using glossy off-white ceramic tiles for its walls, with an accent strip of black stones on concrete in the middle and on the floor. Due to the narrow space, there’s not much space for shelves, so a wall niche was used instead. This bathroom has quite an interesting layout. Two walls are flanked with vanities with upper cabinets, as well as fixed with mirrors and sinks. The wood was finished in dark oak, creating a dark contrast against the oatmeal-colored walls. 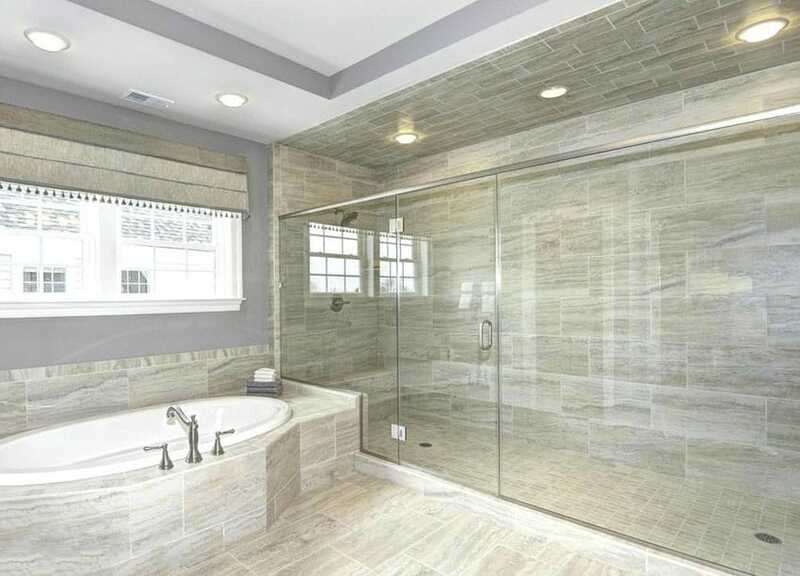 Floors are golden brown granite tiles, in which a drop-in bathtub sits right in the middle, ad is placed against the glass partitions of the shower area. This bathroom goes for a modern rustic look with its choice of finishes. One wall with a large window uses unique tiles which looks like old reclaimed wood pieces, which helps add dimension and texture to the surface. Te rest of the bathroom uses simple satin finish sandstone tiles for the floors and walls, and uses rubbed bronze bath fixtures and accessories. 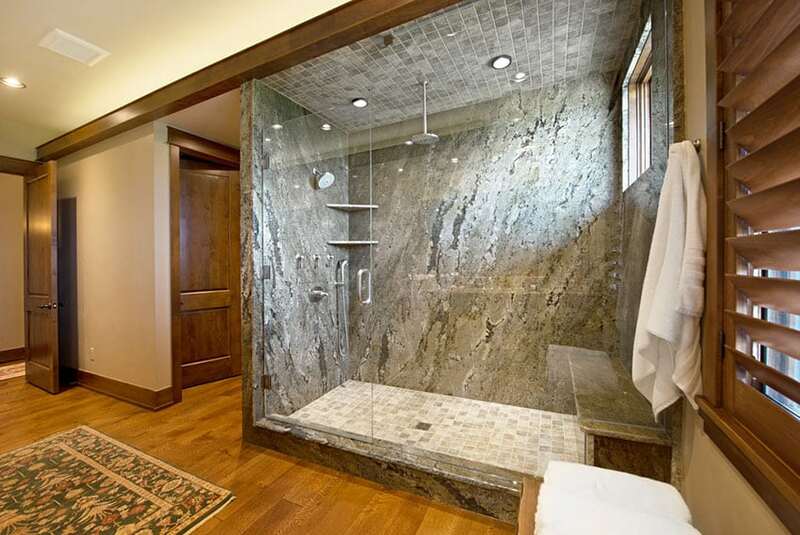 Rather than going for a glass enclosure this stone walk in shower uses a simple curtain. 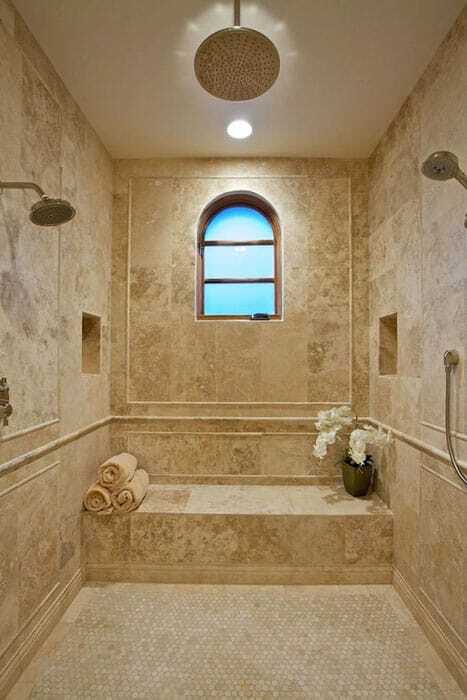 Luxury walk in showers often use exotic types of stone to show their personality and style. Going for a bolder look, this bathroom uses red granite in different forms. Slid red granite was used for the bathtub area and its steps, wile the shower area uses 30×30 red granite on the walls and ceiling, and smaller 10×10 pieces for its flooring, creating an interesting pattern and texture despite the uniform material. Luxury walk in showers are know for being large enough to accommodate two people at a time for a romantic experience. This shower area goes for a softer and warmer feel, using natural stone tiles all-over the floors and walls, and simply adding an accent tile in between the two telephone showers on the wall. Despite the simplicity of the design, the natural elegance of the granite stone tiles is enough to give this shower an elegant feel. Another popular material for walk in showers are tiles. Tiles may be ceramic, porcelain, mosaic, subway, natural stone or faux stone. Tiles add different characters to a walk in shower, depending on its composition and material. It is also widely available in different colors and patterns allowing for more options in terms of design. In addition to that, tiles are readily available in local home improvement stores and suppliers. Elegance doesn’t always have to equal extravagance, and this bathroom design is a testament to that. Floors are simple white marble tiles, while walls are half gray soapstone subway tiles, and half cream paint finish. The shower area’s walls, and even its ceiling are also clad in gray soapstone subway tiles, while its floors uses smaller marble mosaic tiles. This bathroom has a very casual and laid-back vibe to it, which makes it seem like its not actually a bathroom. It’ mostly credited to the face that most of the walls were simply painted in a light mocha color, instead of cladding it with stones or tiles. Opposite the bathtub is a fireplace and a TV to allow you a relaxing bath, while the shower area is in a space right behind the bathtub area with white tiles and a sitting bench. 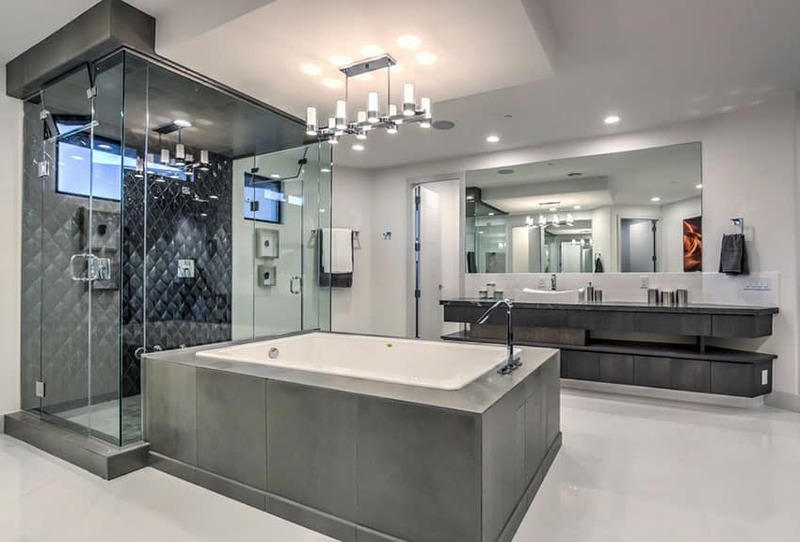 This contemporary master bathroom has a distinctively masculine theme do to its dark gray and black tiles. The glass walk in shower has an impressive black tile accent wall that looks dramatic and overlooks the large enclosed bathtub. This bathroom might be small, but in its simplicity, there is is also elegance. Oatmeal-colored walls adds warmth to the space, while the large windows with a view of the city skyline provide natural light into the bathroom. The floors and half of the walls are clad in white soapstone finish porcelain tiles, while the bathtub’s tile cladding has darker grains to it. The shower area is small and simple, with a stainless-steel framed glass partition and a rain shower head attached on the ceiling. Elegant and extravagantly decorated, this bathroom design would surely make you feel like a royalty every time. It walls are finished with faux marble paint technique, and there are ornamental marble columns, gilded carved details and even a chandelier. Its large windows are draped with heavy curtains, adding both softness and elegance to the space. The shower area, compared to the bathtub area, is a little more simple. It uses porcelain tiles for its floors and walls, with a strip of accent/border tiles. It has a frame-less glass partition and uses gold chrome fixtures to match with the theme of the bathroom. 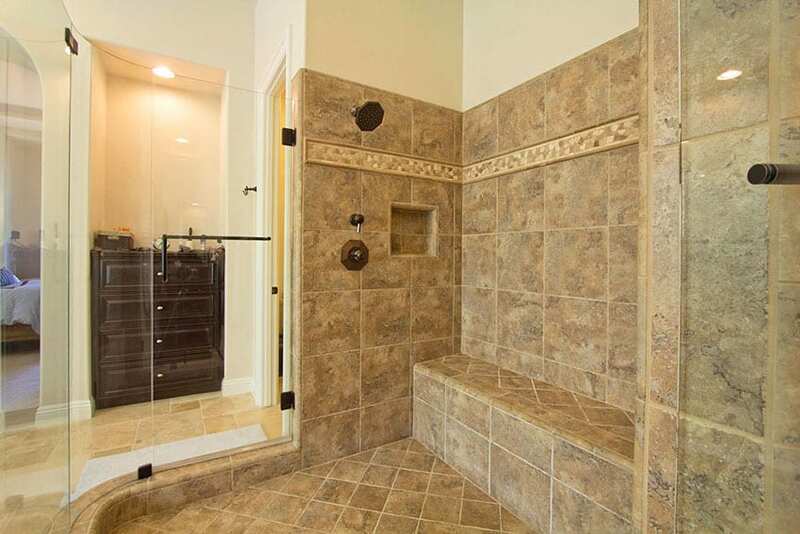 This large bathroom also feature a shower are that is placed right in the middle of the room. 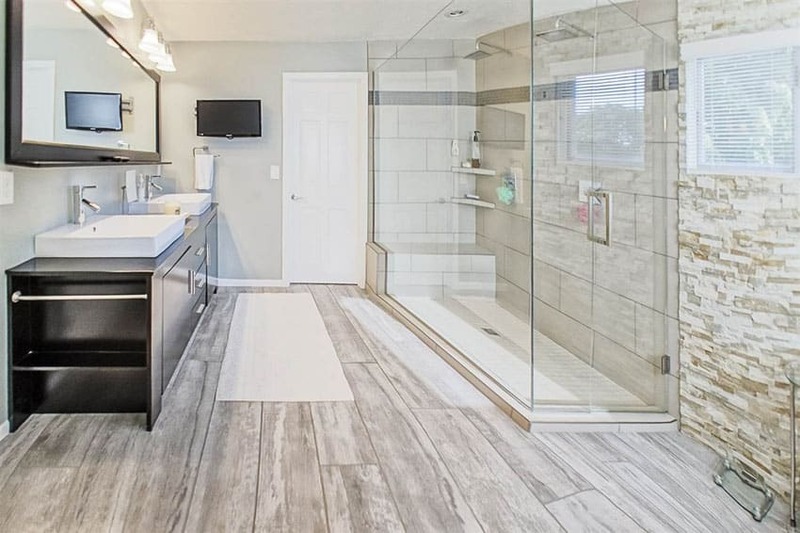 There are vanity counters on both sides of the bathroom, and in between the is the shower area and the bathtub which is directly connected to the front of the shower area. The shower uses green-tinted frame-less glass partitions and a fun dark brown mosaic tiles with white accent tiles. This simple bathroom might be small in space, but offers a variety of textures and patterns, producing a very interesting design. The flooring of choice are wood finish ceramic tiles in a pale ash color, giving the bathroom a rustic appeal. The walls were mostly painted in a light gray color, and the vanity table was finished in dark wengue, making it stand out from the light colored surfaces. There’s an accent wall with cream slate accent tiles, and an enclosed shower area with white ceramic tiles on the walls and mosaic tiles on the floors. Mosaic tiles bring a strong and bold accent for showers. If you want to draw attention to your walk in shower, then this is the right material for you. They are highly preferred not only for their visual appeal but also for their practical benefits as well. Mosaic tiles are non porous, durable and stain resistant. Mosaic tiles are available in a wide spectrum of designs and a myriad of colors. Some have a metallic shimmer effect while others have a glossy appearance. In terms of application, it can be used to cover an eye catching accent wall or wall niches. The mosaic tiles can be mix and matched to produce unique patterns which suits the design of your walk in shower and your personal taste. Glass mosaic tiles, in particular, have a luminous attribute that reflects light well thus attracting the yes and producing a stunning dramatic effect for a bathroom. Mosaic tiles are also widely available in local tile suppliers and is cheaper compared to other materials. Similar to the blue and white bathroom, this modern bath goes all-out with its use of mosaic tiles, only this one uses gold and brown instead of blue and white. Because 1 large wall is already busy with mosaic tile cladding, the rest of the bathroom uses simple light beige tiles to compensate. 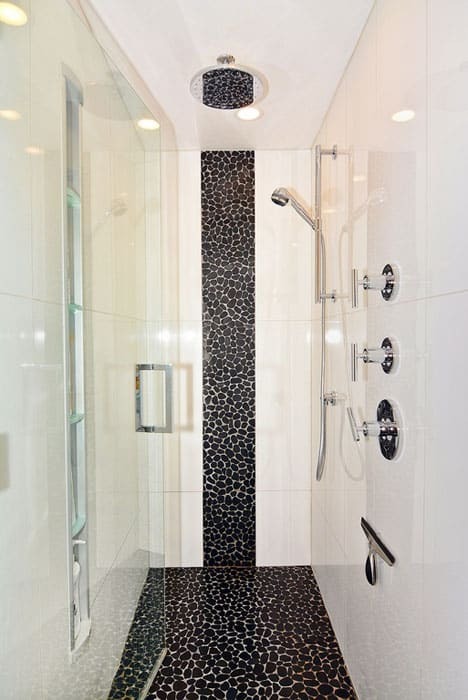 Luxury walk in showers with intricate custom tile work really make an impression. The use of winged lion mosaic accent tiles on the wall of this shower gives this a classic middle-eastern feel, most especially because it uses warm-toned tiles all over the bathroom. A variety of gold/brown mosaic tiles was used on both floors and walls, and accentuated with black granite to help break off the busy mosaic patterns. Like some of the previous examples, this bathroom design looks cool and refreshing, mainly due to the fresh blue paint used all-over the walls. Since the shower area is very separated from the rest of the space, the whole bath simply feels like a large walk-in closet with a small shower pod. The shower area is big enough to fit two people at a time, and was finished with river stone on the walls combined with black and silver mosaic tiles. Mosaic tiles not only adds fun to your bathroom design, but it also adds texture and pattern to the space. This particular example is a fairly small shower area, made more interesting with it’s combination of two mosaic tiles: white mosaic tiles for the floor, bench and the accent wall, and multi-color mosaic tiles for the two, longer and curved walls. This warm-toned bathroom design creates a pixel effect on its shower are by using a combination of brown and cream mosaic tiles all over its walls and ceiling. This helps the shower area become the focal point of the whole bathroom. The large shower area has glass partitions, white mosaic tiles for its floors, and a bathing bench inside. 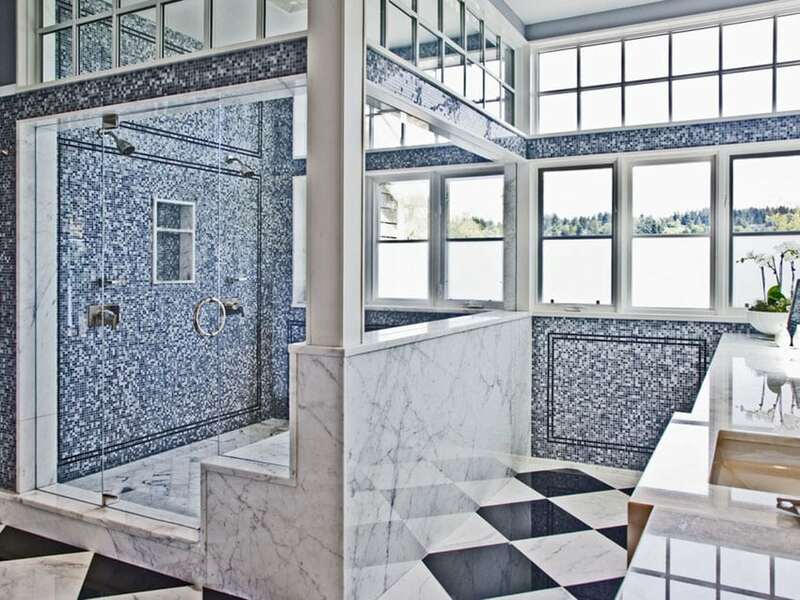 Instead of combining gray with white, this bathroom uses royal blue to match the white finish of this bathroom. Floors is a checkerboard pattern of white marble tiles and plain royal blue tiles. The most unique aspect of this bathroom, however, would be its very bold use of blue and white mosaic tiles which can be see throughout the walls of the whole bathroom, creating a a pixelated effect on its surface. By definition, subway tiles are small rectangular cut tiles that are typically 3 inches by 6 inches in size. This is made of glazed ceramic and is known for their simplicity and classic beauty. Typically in color white, subway tiles are very versatile because it goes with most walk in shower designs and bathroom styles. In addition to that, subway tiles are easy to clean, moisture resistant and stain resistant. When used for walk in showers, subway tiles contribute a crisp look which makes bathroom look brighter and appear more spacious. This material also works well for creating subtle accent walls. Transitional style spaces often adapt a gray and white color scheme such as this particular bathroom design. For the flooring, it combines square marble tiles with chevron pattern mosaic mable tiles, while the shower area combines the mosaic chevron tiles with plain white beveled subway tiles for the walls. 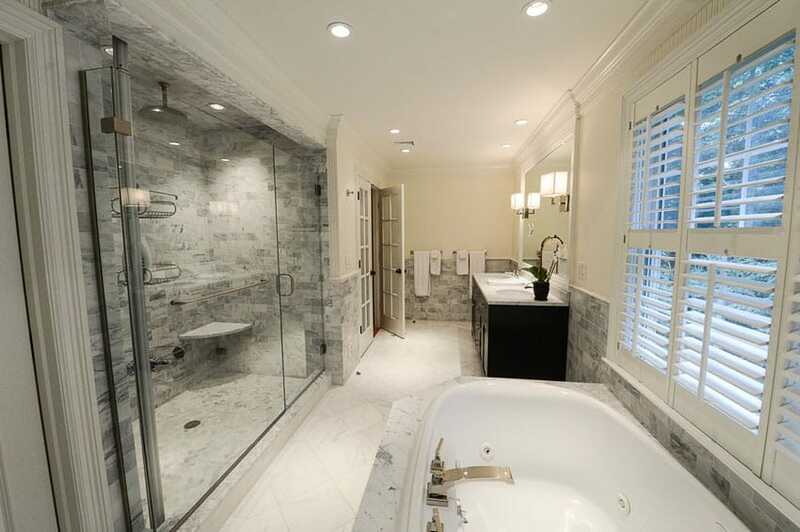 The freestanding bathtub was placed on the bay window area to provide you with a view of the garden. A beautiful transitional style bathroom design which combines modern design with classic pieces and details. The main floors of the bathroom uses 30×60 dark chocolate-colored tiles, while the fully-enclosed shower area uses green-tinged glass subway tiles on its walls, marble subway on the zocalo and ceiling, and white mosaic tiles for its floors. This classic style bathroom definitely demonstrates the timeless elegance of traditional design. Adapting an all-white color scheme for a bright and refreshing feel could end up making the space look dull, but with the use of white basket-weave pattern tiles on the floors and French cabinets for the vanity, there is enough texture and pattern going on in the space. The enclosed shower area uses the same basket-weave pattern floors tiles and combines it with white subway tiles on its walls. To give a little more personality, a crystal chandelier was placed in the middle of the ceiling.